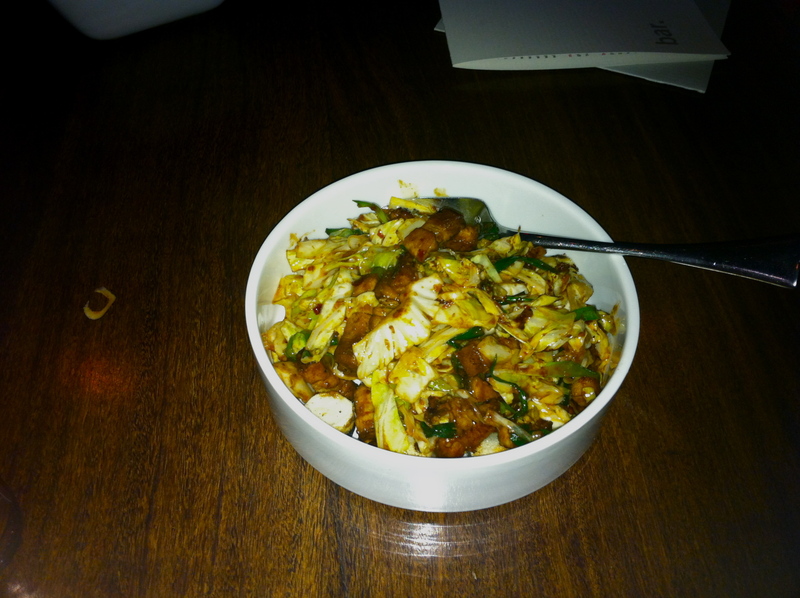 A while back, Sang Yoon opened up a place called Lukshon in Culver City. For some, this was a time to rejoice, as this was the man behind the Father’s Office burger. But for me, it was a time to…well…consider trying out Lukshon. You see, if you know me, you know my disdain for the Father’s Office burger. 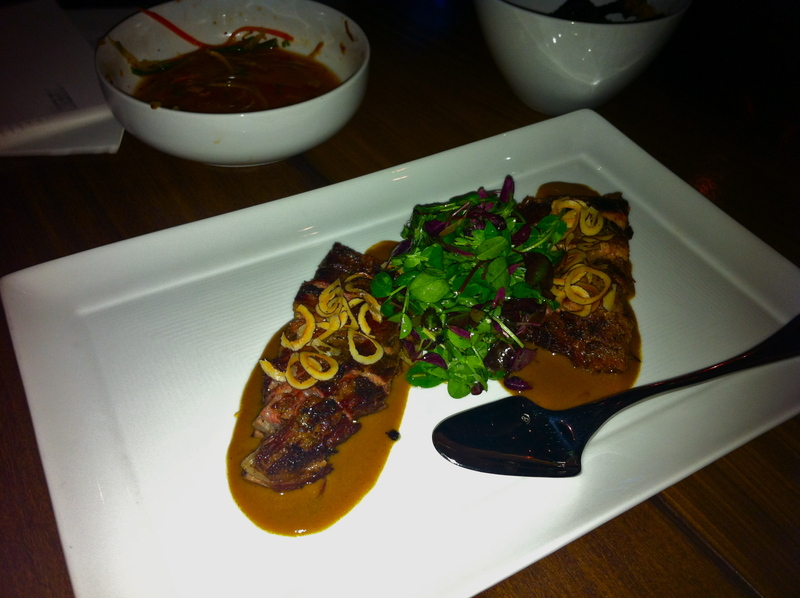 So it took until dineLA’s Restaurant Week to get me out to Lukshon. I went with a sizable crowd, collectively known as the Suppah Club, and we had ourselves a seat at a massive table on Lukshon’s patio in Culver City. While we were there initially for the fixed price menu, a group of us decided to go rogue and order a bunch of things from regular menu, including some of those from dineLA. This was great, as it gave me an opportunity to try more than I would have otherwise, beginning with the Spicy Chicken Pops. These things start out as basic Shelton Farms drumettes before being topped with garlic, kecap manis (a sweet soy sauce) and spicy Sichuan salt. And yes, they were as good as they sound. I loved the combination of sweet, salty and spicy flavor and could not get enough of these. They also had a unique texture, being quite crispy on the outside and tender on the inside. Get in my lamb belly! Next came the Lamb Belly Roti Canai, an incredibly unique dish with perhaps a few too many flavors going on. 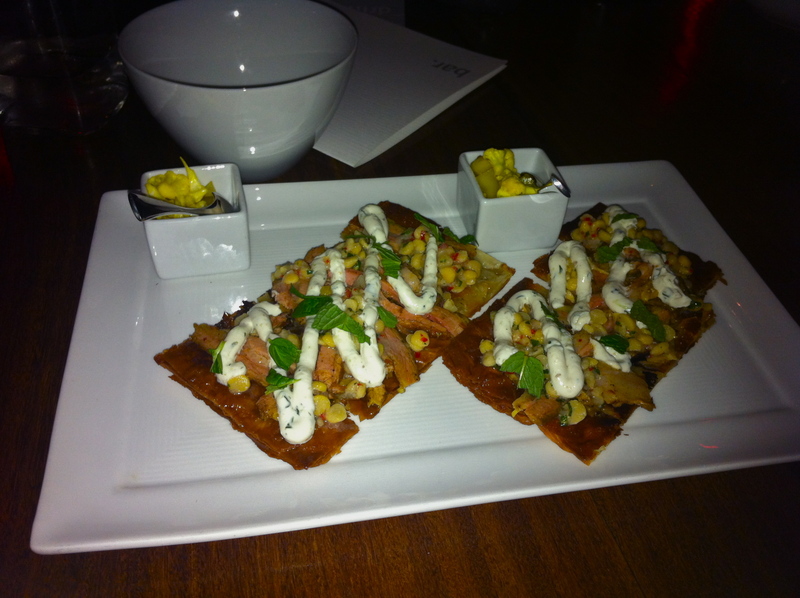 The roti itself is flatbread and the belly was topped with chana dal (a type of lentil), cumin, mint and raita (a South Asian yogurt sauce). There were also pickled cauliflowers on the side, which went right to everyone else. 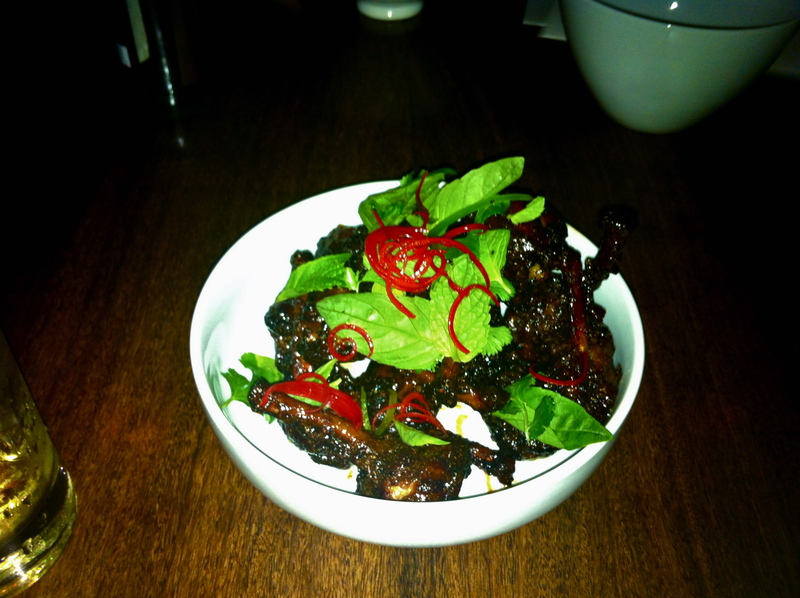 While I was happy with this dish, I felt like I couldn’t really taste the lamb belly itself. Maybe that was the intention, and while I was happy to get protein, I would have liked to taste the meat rather than just the yogurt, cumin and mint. A slight shortage of rib flavor. Then we got down with some Short Rib Rendang, a beef short rib dish cooked with Malay spices and served with a red chile lemongrass rempah (spice paste) mixed with coconut cream. While I didn’t eat much of this, I found it to be quite the opposite of the lamb belly, in that none of the flavors really popped at all. Perhaps my taste buds had taken a vacation after the lamb belly, but I expect some strong Malaysian flavor and was a little disappointed to find none. Nonetheless, the beef itself was cooked perfectly and had a fair amount of its own flavor to offer. This ain’t no side dish rice. 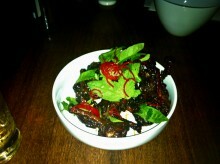 With that taken care of, we moved on to my favorite dish of the night – Heirloom Black Rice. Tossed in with the rice was lap cheong (Chinese sausage), roasted garlic, onion and a Lily’s Farm fried egg. I couldn’t order without the onion, as we were splitting this delicious rice, but if there was any onion in the final product, it went unknown to me. 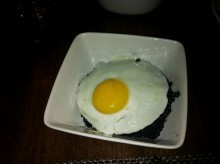 The fried egg was perfectly runny and got sliced, diced and mixed in with the black rice. The result was some spectacular flavor and texture. The black rice is a bit heavier than white and has a tougher feel to it, while the lap cheong is a slightly sweet and chewy sausage that goes well with just about any form of rice. With the perfect balance, the Heirloom Black Rice was the big winner of the night in my heart. A belly surrounded by cabbage. But wait, we weren’t finished yet. There was still Garlic Pork Belly to be eaten. Mixed in with the slivers of pork belly was do ban jian (a spicy paste), tubular rice cakes, cabbage and garlic chives. This made for a dish I needed to pick at. You see, I wasn’t about to be eating cabbage, I do have a reputation to protect. Unfortunately, though, the dish was lacking in pork belly content. When I did find that delicious pre-bacon, it was delicious, but it felt too few and far between. The rice cakes were a nice touch though. They may have been filler, but they were delicious filler with the great flavor of the do ban jian. Now, Lukshon has a unique policy of offering free dessert at every dinner. Ordinarily I love anything free, but I have to think a restaurant offering free dessert for every diner is offloading the costs onto its patrons anyway. And since I’m not a dessert guy, I would prefer a cheaper regular meal. But that’s beside the point, and it turned out that our desserts were delicious. 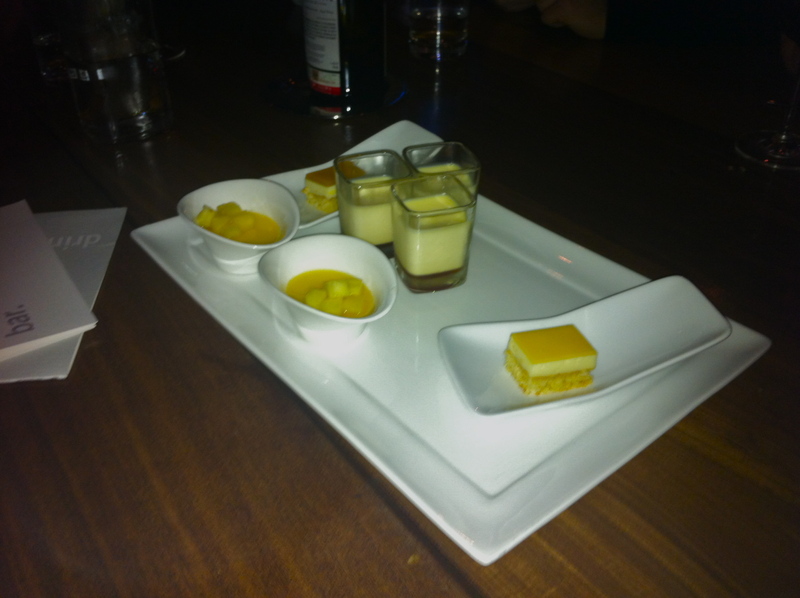 I couldn’t tell you what they all were, but rest easy that Lukshon comes through on desserts. I left Lukshon a happy and full unvegan. While not every dish was a hit, I loved the thought behind them all, the emphasis on local sources and the overall variety of Asian influence. Plus, the great dishes were truly awesome. I also want to mention our terrific waiter, who knew the menu like the back of his hand, made some great suggestions and prevented us from over-ordering anything. With all that said, Lukshon was definitely a step up from the Father’s Office burger and Sang Yoon is moving in the right direction.